A Milnes piece focuses the frog. Faith Milnes had read Hans Christian Andersen's tale of "The Marsh King's Daughter" over and over since she was 12 years old. 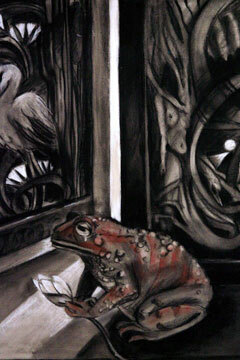 The story tells of someone who was a princess by day and a large, sad frog at night. Magic capes transport characters from Egypt to Norway and back, finding redemption after years of misfortune. Whooping cranes tell the fairy tale that took place when paganism and Christianity were at odds. "It takes place during the Viking invasions and during the barbarian conversions and during the time of Islam," Milnes said. "It is layered with Pagan Nordic folk tales and images and Christian morality." Inspiration, she has found, for her art. Milnes, a printmaker who also dabbles in drawing, painting and other media, began collaborating with fellow artists Linda Kane and Laura Smith to create interpretations of one of her favorite tales. The colorful paintings, woodblock prints -- even a feather dress that they came up with -- bring the centuries-old tale to life in an art exhibit at the Koa Gallery. Kane also remembered Andersen's tales. "Because some of them have a dark side, I wasn't that crazy about them," she said. "'The Marsh King's Daughter' was interesting to me because of all the imagery and symbolism in it." Laura Smith included a suite of 30 prints on actual storybook pages for "The Marsh King's Daughter," an exhibit of interpretations of Hans Christian Andersen's story, on display at the Koa Gallery at Kapiolani Community College. "The small prints pinned to the wall are printed on pages from the story," said Smith. 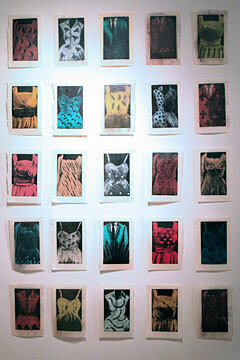 The show also features works by Linda Kane and Faith Milnes. The collaboration was most interesting to gallery director David Behlke. The central motif is the cloak, he said, which represents the ability of Helga, the Marsh King's daughter, to fly. "All three artists key in on the flying cape used in transport," Behlke said. It is represented in prints hanging from the ceiling, the feather dress and a silk rug. "We have all had dreams, especially when we are young, about flying ... the freedom of flying." All three artists took risks with their pieces. 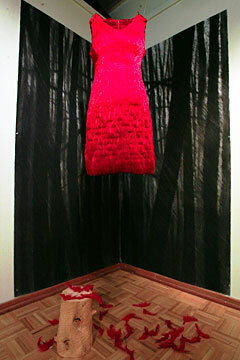 Smith created hanging prints that are suspended from the ceiling, similar to Tibetan prayer flags; Kane had never worked with feathers before, but designed the red feather dress; Milnes added elaborate borders to her works. "She could have easily fallen into an illustrative trap, but she made it into fine art," Behlke said. Andersen's tales are geared more toward adults, Milnes said. "They are very layered. His stories are quite magical; everything is so alive. It's like wandering along an enchanted path. We all have a magical reality, and he puts us in touch with that." Added Kane, "Almost 150 years ago, Andersen wrote this fairy tale. He was an imaginative writer and his creativity sparked my imagination, which produced the work in the gallery. Hopefully viewers to the exhibit will walk away with the realization that everyone has an imagination and they should use it daily." Articles of clothing refer to colors and patterns that are mentioned in the story." The hanging prints were Smith's biggest challenge. "I had never suspended prints from the ceiling. One side is darker, suggesting the night when Helga changes into the frog. The lighter side suggests daytime, when she is a beautiful princess." 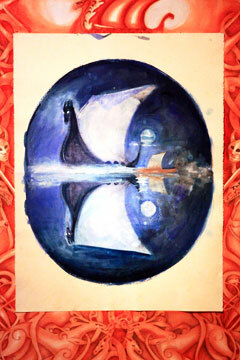 Milnes' painting of the viking ship.